How to Fix Word Files? Microsoft Word is one of the widely used Word processing application and is noted as the most stable text editor with hundreds of handy features. But many users often come across variety of errors while accessing or working on Word documents. The error messages clearly show that the Word file is corrupted. 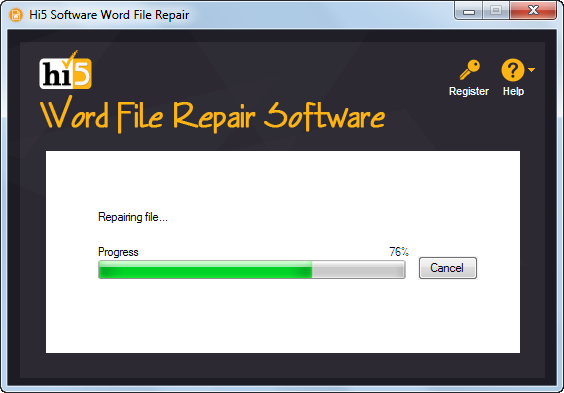 However, one can fix damaged Word file with the assistance of dedicated software named Hi5 Software Word File Repair. Hi5 Software Word File Repair is a powerful and highly-advanced third party application that repairs corrupt, damaged or inaccessible MS Word .doc and .docx files with ease. This software is enriched with numerous outstanding features that resolve various error messages generated while accessing Word documents. It is safe, simple and secure software so that every computer user can use this repair utility without any difficulties. Moreover, this repair software can easily repair corrupted Word files from memory cards, hard drives, USB drives, iPods and external hard drives. Along with repair, it also recovers Word file attributes such as fonts, OLE objects, images, forms, graphs, hyperlinks, tables etc. What is good about Hi5 tool? 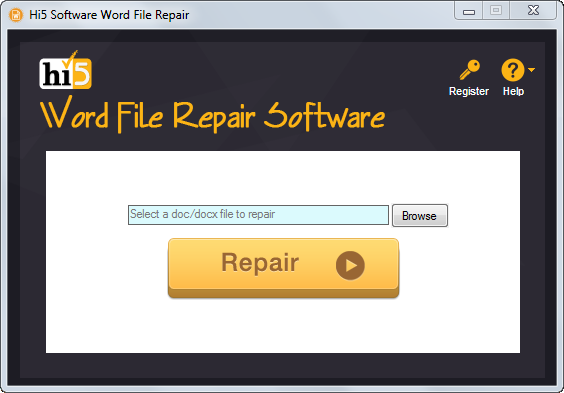 Hi5 Software Word File Repair is uniquely designed to repair inaccessible DOC files by extracting its contents and rebuilding a new healthy Word file. You can be rest assured to download this application as it is 100% virus free and does not modify the original data from Word file. It is available as a trial version for free that allows its users to evaluate the capabilities of the utility before making a decision to buy the full version. Hi5 software’s support team will provide 24x7 supports to resolve your problem and provide answers to any number of questions related to product. 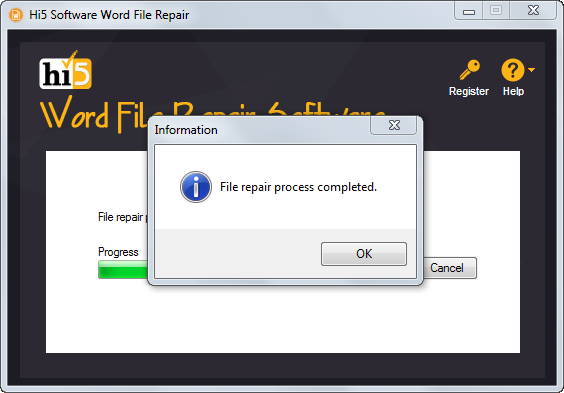 Hi5 Software Word File Repair will help you in reading corrupt Word files swiftly and effortlessly. This tool works on read only mode thus do not alter any actual content. Try Demo version of Hi5 Software Word file Repair to fix problems related to DOCX files on Windows Operating System. It also repair DOC file without any difficulties. Learn how to open DOCX file in Word 2010 by using Hi5 Software Word File Repair. It can easily repair corrupt or damaged DOCX file within few minutes. Utilize Hi5 Software Word File Repair utility to mend corrupt or inaccessible Word 2010 in Windows 7 without altering actual content of file. Hi5 Word File Repair Tool is the easy solution for repairing old Word files which have been damaged due to virus infection, CRC errors, improper transfer of Word files, etc. the software fixed DOC and DOCX files easily! How to Fix Word 2007 File Errors? Hi5 Word Repair Software will help you fix all types of errors from Ms Word 2007 versions. Also supports all other versions of Ms Word and Windows OS platforms. Hi5 Word File Repair Software is the right option to go with when you Word 2013 is not opening in Windows 10; you can fix severely damaged Word 2013 files due to issues in Windows 10 upgrade using this tool. How to Fix Word Document Not Opening from Email Attachment? Unable to open Word document from email attachments? Try these simple steps. Download Hi5 Word File Repair software and repair corrupted Word file. If you get any error message saying ‘unable to read’ while accessing MS Word file, then here’s a perfect solution that can help you in fixing this annoying error. With Hi5 Software, you can easily repair corruption in Word documents and fix content errors. Works with all versions of Microsoft Office including 2016, 2013, 2010, 2007, 2003 and 2000. Download a free trial today! Use one of the best file repair tool called as Hi5 RAR File Repair Software to fix corrupted or damaged RAR files. It supports RAR files created using all the latest versions of WinRAR application. Converting OST to PST never became such an easy task with the usage of productive Hi5 OST to PST Conversion application. Any healthy or corrupted OST file can be converted to PST.